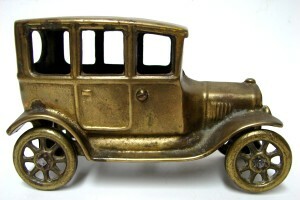 Recently I noticed this molded brass car listed in the Saturday, January, 9th Plato Antique and Vintage Auction simply as “Brass Model “A” sedan car, 6″ long, marked Canada”. and realized I know something about it’s manufacture, and that it illustrates an interesting problem when trying to determine the age of a small production, unmarked (in terms of manufacturer) Collectible. Plato Auctions wisely did not suggest an age, but rather provided honestly all they could determine about the object. That being said I don’t believe they are brass, but rather some kind of bronze-like alloy. In any case, I have seen this car and some other similar, (but different) models many times over my forty-five years, or so, of noticing such things, and every time it makes me feel nostalgic. The reason being, is that I know that at least some of them were manufactured by my father, Charles Ross in Dresden Ontario, in the 1960’s. What is interesting (hopefully) besides the story which I will tell is that at shows, and in articles I have seen them dated over a quite a wide span of time, and with various provenance; and yes it is likely that some were produced before the ones my father produced in the 1960’s, as you will see. Here’s what I remember about this time, and how my father came to make model cars. My father owned and operated the weekly Dresden News, and monthly farm papers, Voice of the Lambton, Kent, and Essex Farmer. All at the time were produced by the old letterpress method, which involved melting and remelting lead to feed into the Linotype machines which produced the copy type for the paper. Those machines are an amazing story in themselves, but I will endeavor to stay on topic. The fact that my father had the technology to melt metals is what’s key. As I recollect I was about ten when my father rather excitedly told me that we were going to drive the hour or so to Corunna, Ontario to buy something that I would be interested in. I loved any drive along the St. Clair river so I was ready, and willing to come along. One fine summer morning my father, mother, and myself pilled into the old Ford, and set out along road 33 which followed along the St Clair river. I remember we stopped at a favorite little lunch spot in Port Lambton for a sandwich, before arriving at the newspaper office in Coruna early in the afternoon. My father was fairly secretive about his business, and suggested that my mother and me have a walk down to watch the boats pass along the river for a half hour or so while he conducted his business. By this point I was wondering what I might possibly find interesting in a newspaper shop, but I could tell something was making my father excited, so I was too. Upon returning, my father met us by the car and flung open the back of the station wagon with a big “ta da”, and there to my delight was a dozen or so Brass and painted black model “T” and model “A” cars and trucks all looking somewhat like the one above. Also in the trunk were three or four crates which I later found out contained the molds used to manufacture the various models. How he heard about them, or why he decided to buy them I do not know, but I remember that after that the newspaper office window was filled with cars and trucks, and that before long people started to come in and purchase them, and of course I had a blast playing with them. I know he had some arrangements to place them with local tourist attractions such as Uncle Tom’s Cabin which is on the outskirts of Dresden, and at other spots throughout the three counties that he used to travel on newspaper business. I also remember his employees making them when they were not otherwise busy working on the newspapers, but I really have no idea how many he made, or for that matter, how many had been made in Corunna before him, or even where the molds came from in the first place. The thing is, to look at them it is easy to imagine, because of the relative crudity of the manufacturing that they were made at the time of the cars they represent, and for all I know perhaps that’s when they started. But I do know that many of these were made as recently as the 1960’s. You would be hard pressed to determine exactly when within that approximately forty year span such a car was produced. Does a 1960 car have equivalent value to an identical one made in 1920? Considering the exact same method and quality of materials were used, I suppose so. And I think reflecting on this suggests that with certain types of small output, cottage industry type manufacturing, we shouldn’t get too hung up in the numbers. And that establishing provenance is always tricky, and sometimes an “educated” guess at best. And most importantly that in the end this ambiguity doesn’t take away at all from the beauty of these toys from a simpler time.